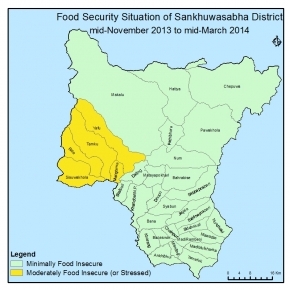 Overall food security situation is classified as Minimally Food Insecure . The household food stock was sufficient for more than four months due to recent harvest of paddy and millet as well as previous stock of maize. Though in cluster "C" HHs food stock is only for 3-4 months due to production only on marginal land. Market stock was found to be sufficient as regular supply as well as NFC had distributed 63.4 MT during this period however, the market price of rice was found to be increased by 8-10% compared to last year. This district earned high income from the sale of NTFPs (cardamom Chiraito, Allo, Rudrakchha) and citrus fruits especially on cardamom at the rate of NPR 40- 65 thousand/ 40kg. Wage employment opportunities are normal in agricultural fields and development activities supported by I/N/GOs. Remittance was the second major source of income that contributes to an average of NPR 100 million to support for food security as 7 people out of 10HHs being out-migrant for working purpose in abroad countries. On the part of utilisation, water supply system being well facilitated however lack of proper management, sanitation had been a problem. Livelihood strategies were found to be traditional and optimium calorie intake aquired as of festival season. No cases of epidemics and severe diseases as well as natural disasters were observed. Food secuity situation is expected to be Minimally food insecure for Next Cycle (mid November to mid March 2014) however cluster C is expected to be detoriated as moderately food insecure due to inadequate households food stock (2- 3 months), less wage employment opportunities & no income from NTFP or cash crops, as well as livelihood strategies will be probabily detoriorated. They are likely to migrate to district DHQ and Terai region to escape from adverse cold. Cluster A and B will have sufficient food stock; income from NTFP (rudrakchha, Allo, Amlisho, medicinla herbs) and vegetables; wage; livestock products as well as wage opportunities support by I/N/GOs.